Why all the fuss over a little French cookie, you ask? Each bite of one of these unassuming little gems begins with a light, crispy crunch, leading to a chewy almond meringue and then a smooth, creamy interior – a combined bite of texture and taste that might just make you melt at the knees. 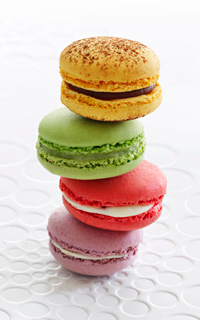 French macarons come in an array of bright and lively colors and flavors, and are fast becoming popular wherever they can be found – which, outside Paris, isn’t all that many places…yet. Coaxed along by the world famous award-winning pastry chef Francois Payard, this French favorite’s moment seems to have arrived stateside, where it is slowly making its way into the American public’s lexicon of culinary delights. Beginning one year ago, with the establishment of Macaron Day NYC 2010, Payard began a new American tradition that reflects one celebrated in his native Paris each year – Jour du Macaron, a creation of La Maison Pierre Hermé.